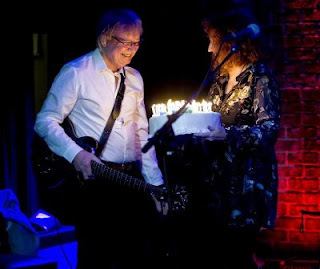 British Blues-rock great Kim Simmonds, founding member of Savoy Brown, has had a lot to celebrate in 2017. Earlier this Fall, Savoy Brown celebrated the 50th anniversary of its debut album being issued with the release of a brand new studio album, Witchy Feelin', which proved that the Devil still has all the best tunes. Then, last week, Friday December 1 he celebrated his 70th birthday during a performance at NYC's Iridium! From the thrillingly brittle guitar riff that opens the new album, Why Did You Hoodoo Me, we clearly are in the hands of a master, with Simmonds reigniting the seismic vocals and searing fretwork that established Savoy Brown as linchpins of the '60s British blues boom. "On this album, I tried my best to get my voice in its power zone," he explains. "I'm a baritone singer. I like listening to singers I can relate to, such as J.J. Cale, Mark Knopfler, Tony Joe White and Tom Rush. For my guitar playing, I still get inspiration from Otis Rush, Buddy Guy and all the Chicago players I grew up listening to back in '63... but I always listen to new music too."